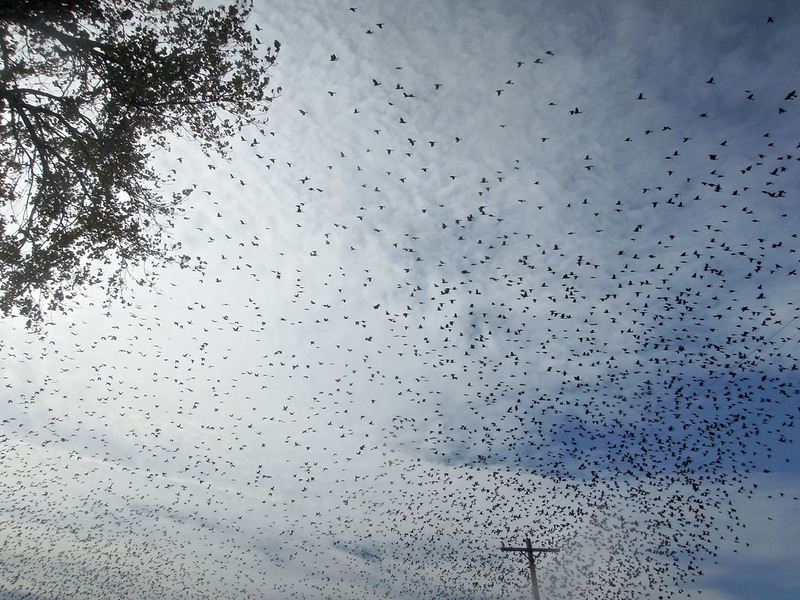 Giant black clouds of birds have been erupting from cottonwoods everywhere I go the past few days. 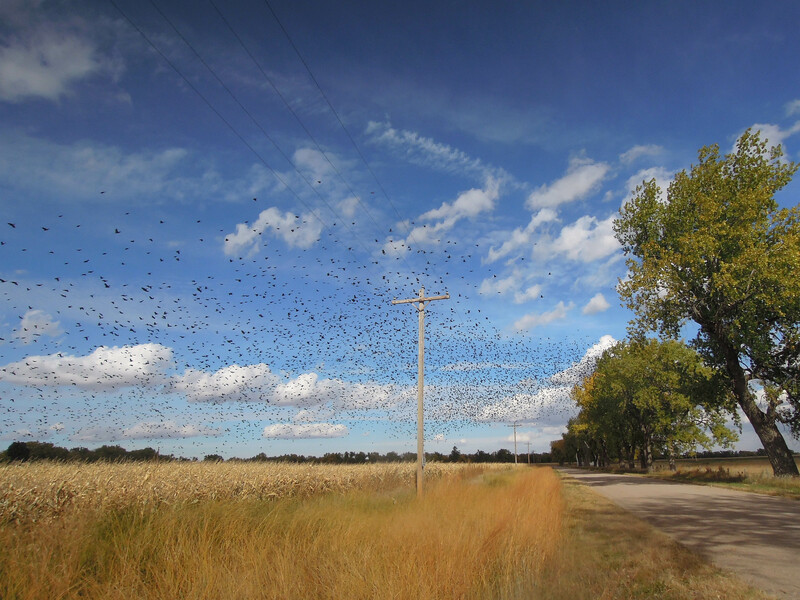 A huge overhead flock (called a murmuration when the birds are starlings). As Anne recently shared, the cows have been taken away from our prairies for the winter and, somewhat surprisingly, their absence has really been felt around here. They were quiet company, but extremely entertaining at times, creeping toward me while I picked seeds until I lurched suddenly just to watch them bolt in the other direction. Before long, they’d crept back even closer to me, and we went on like this for many hours. cows. 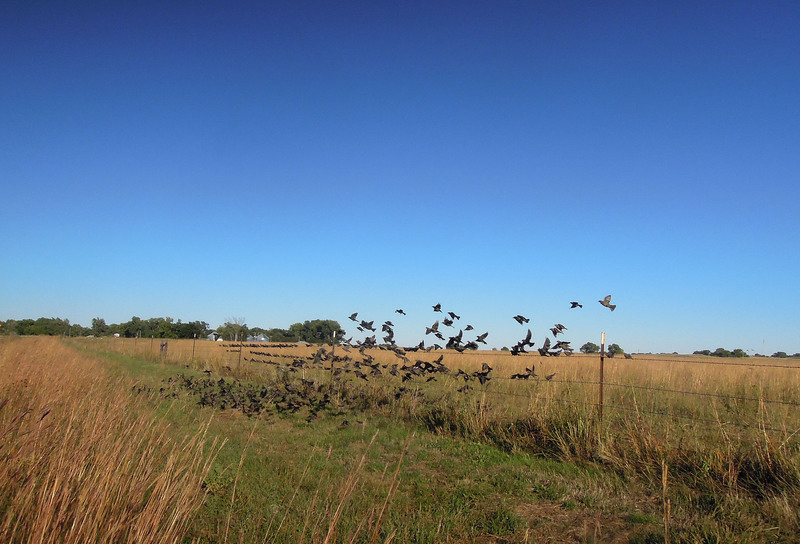 I saw a large flock of birds along a fenceline and pulled over to the side of the road to get a better look at them. The cow-bird interaction I witnessed was, or seemed to be, quite playful. And funny. As if on a mischievous (or vengeful?) whim, the neighboring cows rushed at them. 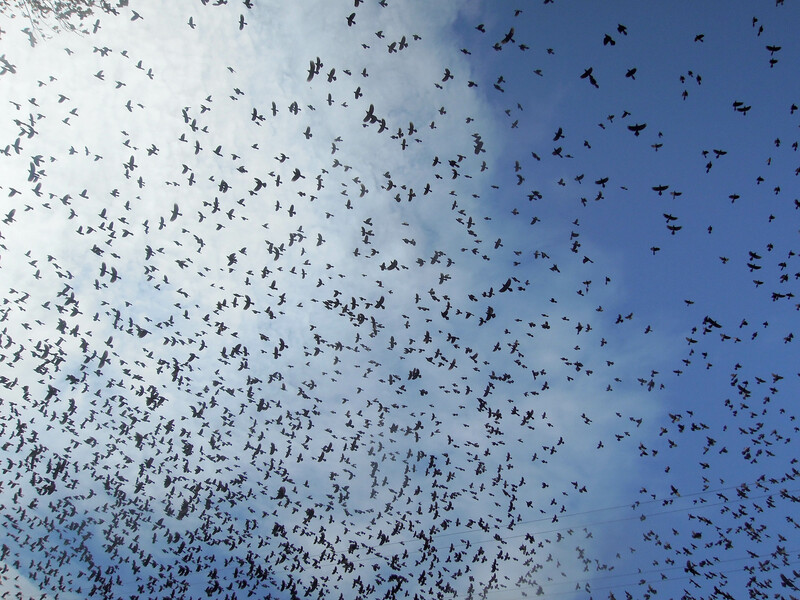 The birds lifted into the air in perfect unity, an effortless coordination that is said to resemble magnetism by statistical physicists studying similar behavior by European starlings. 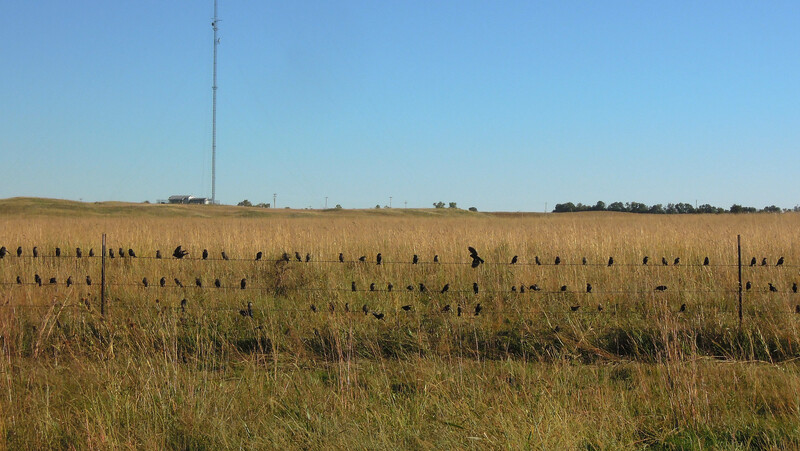 Reluctant to give up their spot entirely, the cowbird flock settled down again close by. That is, until a lone calf honest-to-goodness peeled away from the group and charged the fence, seemingly aiming right for the birds. Maybe there was another reason for his behavior, but I like to think this calf was putting on a show. That was apparently the last straw for the birds, and they flew away toward the river. 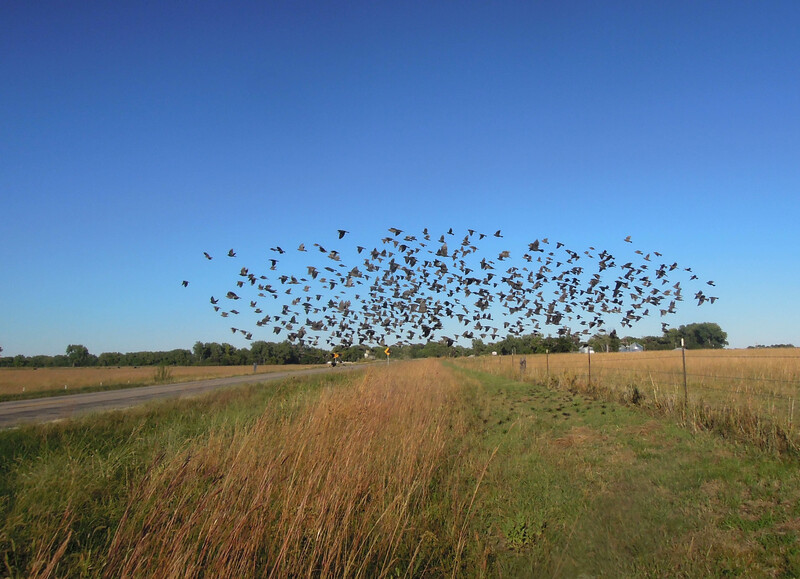 I know starlings are invasive, outcompeting other species like bluebirds and woodpeckers, and cowbirds have a nesting parasitism habit, but the huge flocks these creatures form are a wondrous sight. I was picking rosinweed one morning when things were going any way but mine (I thought I broke two backpack sprayers in a span of two hours), and a gigantic murmuration passed right over me for about ten minutes, with no end in sight. Just a long, chirping highway. This event, along with my renewed awareness of the quiet, scenic solitude where I work, lifted my spirits and ended my morning funk. 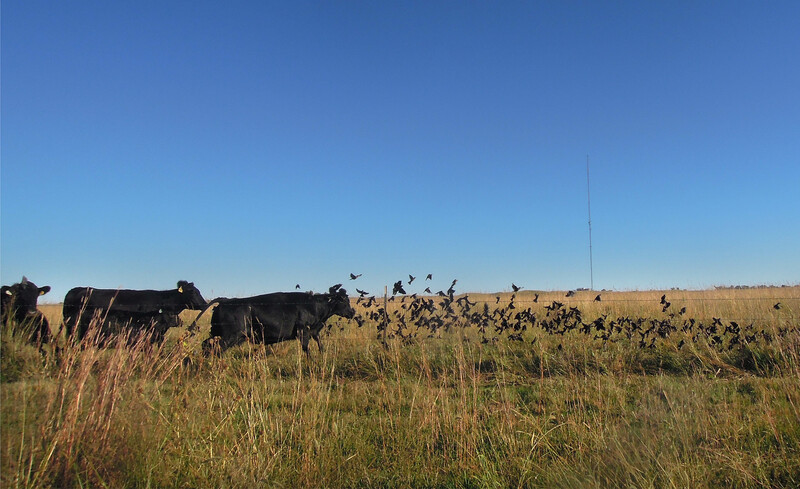 The prairie has a knack for doing that to me – and I imagine it does so for everyone else reading this – so I think I’ll be all right without my cow companions. 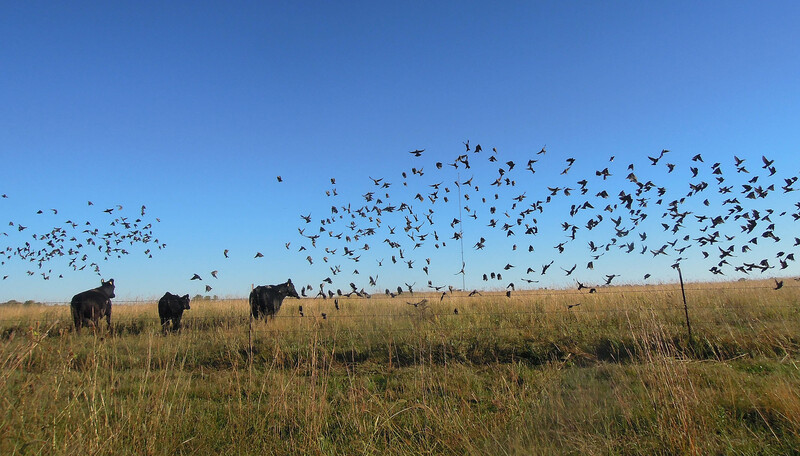 This entry was posted in Prairie Animals, Prairie Natural History, Prairie Photography, Uncategorized and tagged behavior, bird, brown headed cowbird, cattle, cow, cows, eliza perry, flock, flock behavior, hubbard fellowship, interaction, murmuration, nebraska, platte river prairies, starlings, the nature conservancy by Chris Helzer. Bookmark the permalink. Great post – how to cool to catch this fun behavior in pictures! When I was working on the prairie in Canada, I had similar experiences with the cattle there – young steers, in particular, loved to creep closer and closer to me while I worked and then run away when I looked at them. So silly. Not a fan of starlings, as they chase away songbirds. Now an even bigger fan of cows, especially the calf in this post. It is a moment of awe when these flocks are never ending. I can hear them from inside before I can see them. On the East Coast swarms of blackbirds will do this. I’d be curious on how to tell them apart from the starlings when they are so high up. Is there an easy way to distinguish between the flocks (note I am not a birder – just a nature lover). Love the pictures! It’s really hard to tell them apart when they’re up high. Down low, you can sometimes see the red wing bars of red-winged blackbirds or the contrast between black body/brown head of male cowbirds. And seeing different male/female appearance helps distinguish between some species. Of course, the complication is that there are often mixes of species within flocks, so that makes it pretty hard…! And starlings have relatively short tails that pretty easily distinguish them from all the true blackbirds. I too, share your wonder at murmurations. I recently spent a half hour gaping at masses of starlings (I did a quick estimate of at least 30,000, perhaps 2-3 times that number) sailing in at sunset in gigantic waves to spiral down into a single Phragmites thicket. Almost miraculously, when I walked up close once the show was over, except for a few faint rustlings, one had no clue there were any birds present at all. Despite having spent decades battling non-native species, I hope I will never lose my appreciation and wonder at such beauty, even when displayed by actors with invasive inclinations. 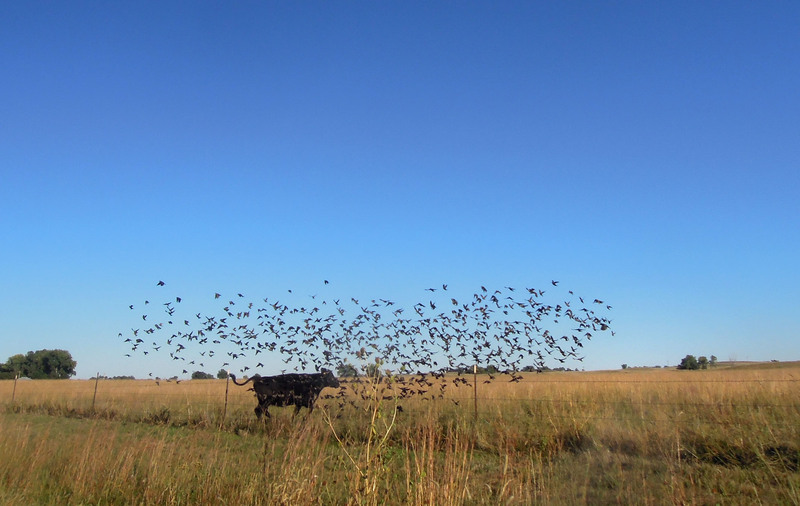 I know this post was about birds….but I was curious to know more about the cows! Do you send them to a feed lot and then off to slaughter, or are they overwintered somewhere? Really nice post! Thank you. Reference to the backpack sprayer has sparked my curiosity about the use of herbicides in your work There’s probably a very long answer to this question, and also a short one. Chris, can you comment? Sure. Herbicides are an unfortunate necessity in our work for two main reasons. First, there are some species that simply won’t die without herbicide use (many deciduous trees, Sericea lespdeza, phragmites, etc.). Second, at the scale of 4,000 acres of land to manage, even species that could be killed manually (musk thistle) can overwhelm our ability to get them with shovels or other hand tools, at least at times. We use the most selective chemicals we can and apply them in the most selective way we can to minimize damage.